‘Serving the patient’ is the main component in the assignment Amgen gave D/DOCK in 2015, to develop the so-called NextGen Office concept. 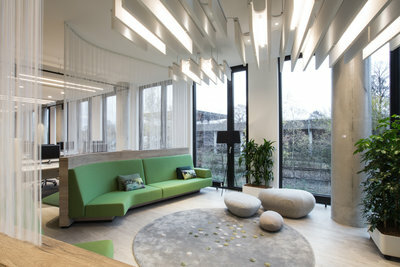 Serving the patient indirectly means: caring for the Amgen community, with a connection between the organization and a healthy and happy working environment” explains Coen van Dijck, Managing Director at D/DOCK. The design is characterized by its openness, playfulness, softness and a high level of variety in terms of features and styles. 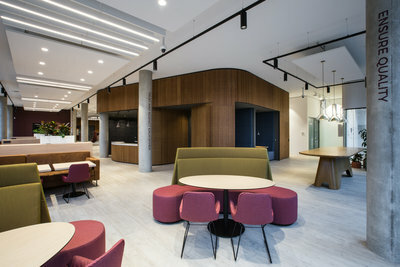 The three-story office is connected by a core, that runs through the building like a vertical connection and contains meeting rooms, huddle rooms and concentration booths with a variety of styles and features. "This prevents Amgen employees from seeing their floor as a territory, and instead, encourages them to use the entire building, so that they’ll have more face-to-face interaction. This results in more exercise, better communication and a higher level of satisfaction", Roland Wandeler, CEO at Amgen Munich explains. 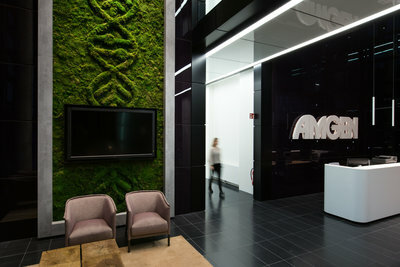 The first thing one notices upon entering is the 14-meter high green-wall which shows the core activity of Amgen –the DNA-double helix, in 3D moss-design. 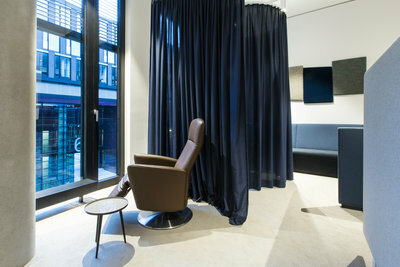 The traditional front-desk area has been replaced by a lounge area with relaxing arm-chairs in warm colors, closely resembling a hotel lobby. The first introduction to the working environment is the Amgen Café. A luxurious coffee bar-like environment, available to the Amgen employees to start their day with an Italian cup of coffee and a fresh breakfast. The café is designed as a multifunctional area with a buzz throughout the day, for breakfast, lunch and meetings. In addition, a roman theater has been built, with room for fifty people for a big presentation with live group video connection to other Amgen offices across the globe. 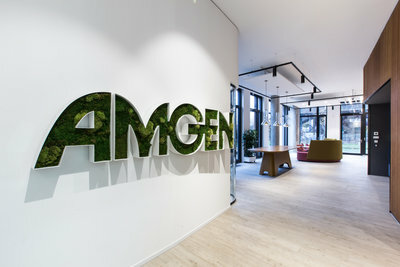 Contrary to most big organizations, the executive team decided to be located at the ground floor, with an open connection to the Amgen Café. Because of this, the mutual communication has improved greatly, due to which there is no place for hierarchy in this Healing Office. The open space working environments with a total of hundred and seventy workspaces have organic carpet islands in the wooden floor and serve as a walking route. To create identity and recognition within departments, every division works with its own color palette and own piazza: a large seating element intended for a certain department in which branding meeting and storage is located. 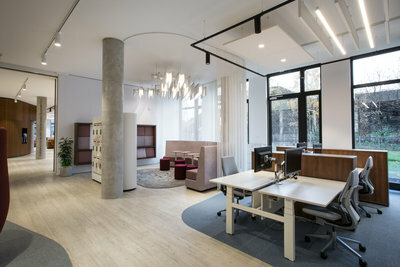 “The office has become a lifestyle environment, in which every department is defined by a unique feature, its own style, bure above-all connection and collaboration” Francesco Messori, Design Director at D/DOCK explains. In addition to providing collaboration and dynamics, the working environment also provides a counterbalance of rest and relaxation. 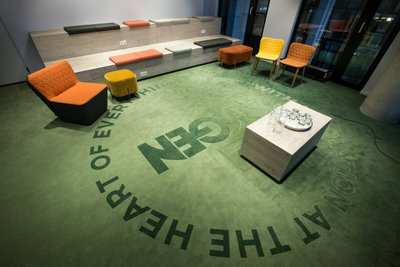 The first floor is fitted with a Zen Garden: a courtyard setting, allowing people to concentrate and work, read, sleep or relax with ambient sound with the available headphones, amidst all the green. On the second floor, the Silent Lounge is located, where work and relaxation meet. 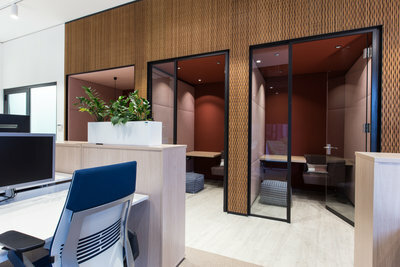 The entrance is a special acoustic tunnel, in which the transition from a busy work area to the silent area is emphasized as a change of environment. 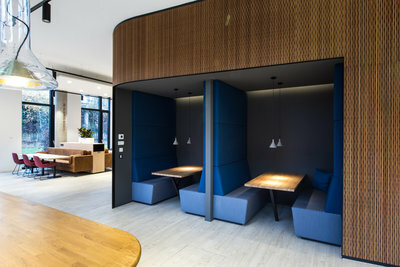 Behind it, a library setting was built, in which various work typologies have been included: a collaboration lounge, two concentration spaces and two powernap chairs. The latter is a typology developed by D/DOCK in which people take seat on an adjustable recliner, located within a cocoon-like area. This is possible with a laptop, paper documentation or simply to have some shut-eye. A major change for a lot of organizations, but very fitting for the transition that NextGen is making. As bearer of dynamics and collaboration, the Plug and Play area is located on the second floor. 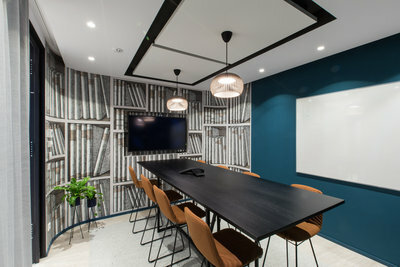 This area is characterized by a large open floor, which can – by means of flexible walls and a random range of individual furniture, cubes, poufs, lounges and mobile whiteboards, be transformed into an area for various workshops, all-staff meetings and a training center. The working environment has also been given an ergonomic approach as a lifestyle environment, giving people options in how to sit, stand or lie down when working. After all, when we’re at home, we make use of this flexibility as well. The team areas are equipped with sit-stand desks, the meeting areas will each have different features, from standing meetings to balance boards and from a high seated and theatre setup to a boardroom set-up. 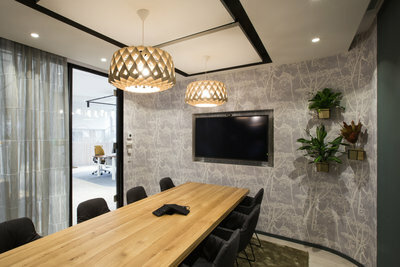 This functionality is reinforced by optimal AV and IT support, in which connectivity and digital collaboration is a matter of course. Remarkable about the interior design, is that it makes everyone feel at home. This was realized by using comfortable sofas and customized dinner tables for instance. Besides that, a high level of tactility was applied in the materialization and a special color pallet was used to give the area a soft but dynamic look. In addition, the modular lighting in all areas really comes into its own by the fittings of the Core. It has been furnished with 3D-milled bamboo, which has never before in the world been applied in its bent form. “We have chosen a location that allows people to work together more effectively, where staff has more authorizations, where we could improve decision-making and where everyone can explore creativity and innovation”, says Roland Wandeler. “For that reason, we selected an extremely innovative architect and design team with innovative ideas, that has opted for the right combination of culture and design. 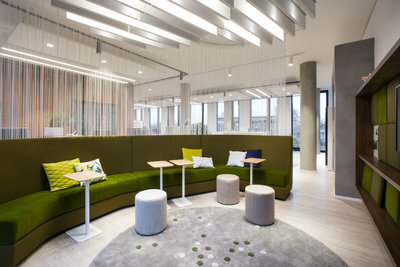 D/DOCK has given our new workplace a special footprint: it is a unique, innovative, and, at the same time, welcoming working area. Employees were given their opportunity to make the new area their own. In that, we want to make innovation tangible, every single day”. The construction of Amgen in Munich was carried out by D/DOCK Projects in collaboration with Baierl & Demmelhuber, Intos, OfficeDock, Haworth, Steelcase, Yorktel, Kas and Unisys. Meanwhile, D/DOCK has begun the continued development of the NextGen Office for Amgen in its new European headquarters in Zug, which will open its doors in June 2018.